I get to drive a lot of pontoons and the range these days is nothing short of incredible. From the high end, ultra-luxurious, high-performance, tweaked-out machines to, well, to be honest: this. That does not mean that the Bentley – affectionately known, officially as the “Li’l Bentley” – 180 Cruise SE isn’t a great boat. In fact, it’s just the opposite. Encore Boat Builders pride themselves on making everything in house from upholstery to rails. Just about everything, aside from the engine and electronics, they make. And when you’re in control of the whole process you can ensure quality. With a 50-horsepower Mercury, you have more than enough power for a small, two-log pontoon. You don’t buy something like this because you want a thrilling top-end or mind-blowing handling. You buy it to be comfortable in a well-built boat to cruise around a small to mid-size lake, or canals and rivers. The top speed we hit was 20 miles per hour with a two-person test load. That was running full out, tweaking the trim and placing the passenger appropriately. A more consistent top end was closer to 19 miles per hour, which, again, is enough for what this Bentley is all about. You can putt along at five mph or cruise along at 15 and, other than the time in which you’ll reach your destination, not much changes. 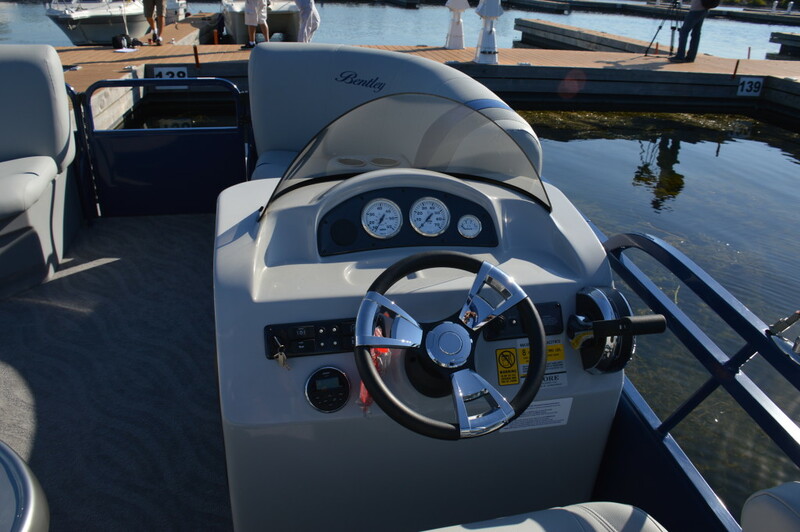 There’s nothing massive in terms of bow rise, there are no rattles and bangs that you used to associate with entry-level pontoons, and with the new Mercury hanging off the back, there’s not much noise. I’ve long maintained that priority one of boating is enjoyment, not specs or performance data. I was having too much fun cruising around on a late summer’s day in this boat. Given the fact that I didn’t want to bring the Cruise 180 SE back to the dock once our test was done, I say this Bentley gets full marks in that category. This profile is featured in the 2016 Boats&Places Test Issue and on BoatTest.ca.